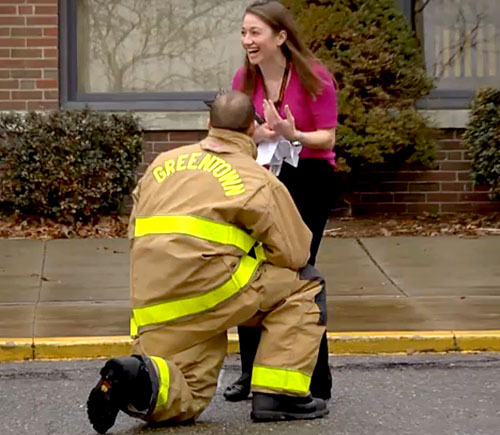 What seemed to be an ordinary fire drill turned into a magical moment for Miss Z and the students of Greentown Intermediate School in North Canton, Ohio, when the popular counselor’s firefighter boyfriend delivered a surprise marriage proposal in front of the kids and faculty. 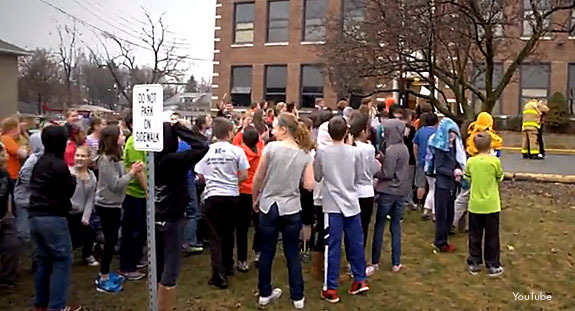 On March 19, Megan Zahorec (affectionately called Miss Z by her students) was completely convinced that she and her students were exiting the school building to participate in a drill with the local fire company. 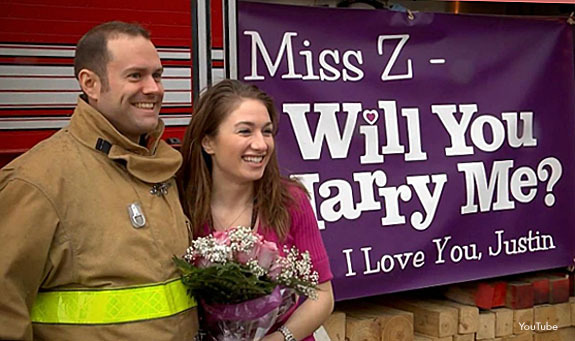 She soon learned that something more exciting was brewing when the side compartment of the fire truck parked in front of the school slid open to reveal a large purple sign that read, “Miss Z — Will You Marry Me? I Love You, Justin." 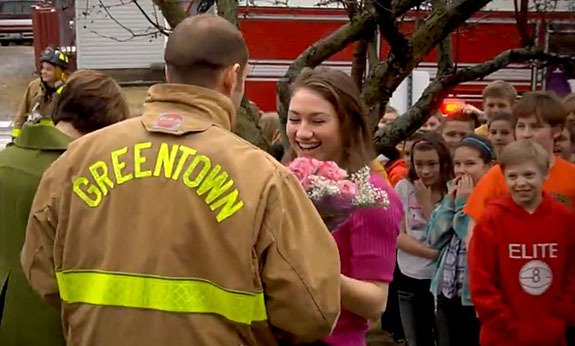 At that moment, firefighter Justin Deierling (dressed in Greentown Fire Department protective gear) went down on one knee and presented Miss Z with a diamond solitaire ring. She accepted his proposal, the couple embraced, and the excited students could hardly believe what they were witnessing. Back inside the school, the celebration continued as Miss Z, Deierling and the other firefighters distributed 600 Ring Pops to every student. The four-minute feel-good video of the event has gone viral, with more than 890,000 views on YouTube. 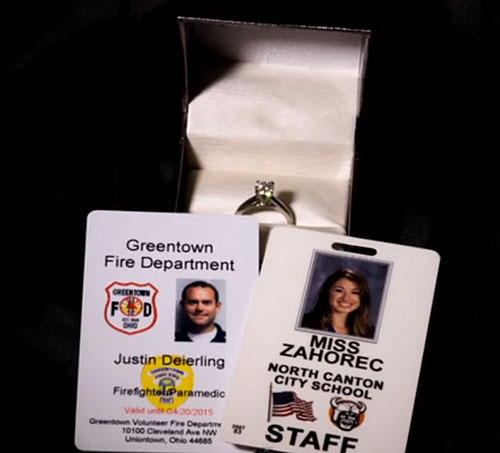 Deierling, 31, and Miss Z, 27, had met at the Greentown fire station exactly six months earlier during a charity event. "We passed out water to kids in a walkathon,” Deierling told the Huffington Post. “I knew instantly that she was someone special by the way that she interacted with the kids. I wanted to incorporate how we met and the kids, who she adores, into the proposal." Deierling’s brother, Adam, told TODAY.com that Justin had been planning the surprise for two weeks and that just a few people at the school and firehouse were in on the ruse. In recounting his story to the NY Daily News, Deierling remembered driving up to the school in the fire truck, seeing hundreds of children filing out of the school, and thinking, “You can’t back out now.” He also worried about losing the ring, checking for it over and over again under his bulky equipment. From Miss Z’s perspective, she remembers being distracted with paperwork on the morning of the proposal and somewhat annoyed that the fire drill was taking place during the cold weather. "I was trying to get everything done and Justin was trying to talk to me," she told The News. "He said, 'Look at the truck.'" That’s when she saw the proposal sign and her life was about to change forever. Check out the viral video below.